This is the section where the Tampa Bay Buccaneers UK Supporters Club can fully recognise the help and assistance given by friends and colleagues around the world as well as great players from franchise history. Inductees are listed below along with their reasons for inclusion. The lengths Nick has gone to in recent years to help club members watch Buccaneer games is simply staggering. From linking up his TV to his home PC to allow viewing via Slingbox, to obtaining Buccaneer games on DVD for people to remember their memorable days in Tampa, Nick has been a superb friend to the club. And hence he has joined myself and Phil on the sideline the past two seasons as well as on the Pirate Ship for the Green Bay game in 2009 and at the Bucs' 30th anniversary event at One Buc Place the night before the Bucs' first win that season. No-one has done more to provide Bucs UK members with competition prizes than Rick in the history of the club. Rick is an avid game merchandise collector and has donated game-worn jerseys, exclusive merchandise and other prizes during my two past trips to Tampa. He is also the biggest Young Ones fan on the American side of the Atlantic! "It's been a pleasure gathering Bucs goodies for my UK friends and I look forward to providing even more stuff in the future. I feel like it's the least I can do for a website that has provided me with countless answers to questions that have arisen during the course of my collecting Bucs game used equipment. "In my 8 years as a collector, the timelines, game details, player profiles and photo galleries housed at Bucpower have helped me to either legitimise or discredit a large number of items that have been offered to me for sale. "The Bucpower database has proven time and time again to be the ultimate reference tool for myself and anyone who is a fan of the Bucs, and should an answer be required for any one of the more obscure questions I've had over the years, the database inside of Mr. Stewart's head always comes through without fail." The NFL Films documentary about the Bucs UK would never have happened without it being Adam's brainchild and perseverance in running the project from an idea to reality. Adam not only travelled over to Wembley for the Bucs' game against New England but also contributed many prizes for the Bucs UK in terms of NFL Films merchandise. Adam grew up outside Philadelphia, and never became an Eagles fan because the idea of slinging snowballs at Santa Claus and spending the rest of his life booing didn’t appeal to him! 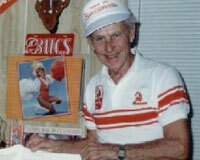 As a child, when he began to follow football in the late 70’s the Buccaneers were a rising power. And then, to secure his allegiance, they beat the Eagles in the playoffs. When he started at NFL Films, as the low man on the totem pole, he was given one of the NFL’s worst teams to do a highlight film on. Lucky for him, that was the Buccaneers. He has produced their highlight film since 1994, and says it has always been a joy to do it. Brian is the Buccaneers' Vice-President of Business Administration and went out of his way during 2009 to make the year an incredibly special one for members of the club. From organising the appearance of former players and cheerleaders at the touch football, to inviting myself, Phil and Nick Houllis to the 30th anniversary event at One Buc Place. His hospitality in Tampa was also appreciated by both John Davies and David Cambridge who enjoyed tours round One Buc Place thanks to his time and effort. 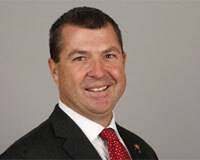 Brian joined the Buccaneers in November of 2006 and was promoted to Director of Business Administration in October of 2007 and oversees all day-to-day business operations for the organization. Prior to joining the Buccaneers, he was part of the team that opened Raymond James Stadium as the District Manager with Fine Host Corporation in 1998. 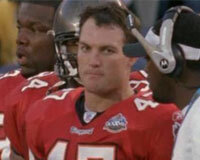 He remained in that capacity until 2006, when he began his career with the Buccaneers. He has also served as an Executive Committee Member for the Super Bowl Host Committee, and also serves on the Board of both the Ronald McDonald House and the Florida Sports Foundation. A native of Miramar, Florida, graduated from Florida State in 1989 with a B.S. in business administration. He is an avid runner and tri-athlete and competes in numerous events each year, including the past five Disney Marathons. 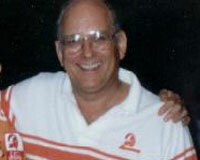 He and his wife, Judy, live in Tampa with their sons Brian III and Brandon. The couple are celebrating their 20th wedding anniversary this August. Judy is an active member of the Buccaneer Women’s Organization, which hosts charitable functions and community service projects in Tampa Bay throughout the year. 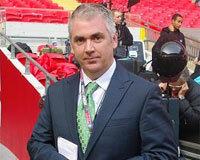 Denis made the ceremonial trip across the Atlantic for the Bucs' game at Wembley in October 2009. Married to Amy and residing just outside Cleveland, Ohio, Denis was born and raised in Florida and became a Buc fan at a very early age. He attended Florida State and worked for a year as an intern for TJ Rives on the original 820-The Team radio station in Tampa. He is well-known to Tampa Bay fans worldwide for being the author of the magnificent book about the 1979 Buccaneers, McKay's Men which should be an essential addition to any Buc bookshelf. Tampa Bay's first-round pick in 1978 and the leader of the franchise for the next five seasons as he led the Bucs to three playoff berths in four seasons. 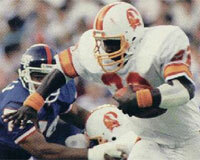 Always a strong-armed leader, he spent three years in the USFL after a contract dispute with Hugh Culverhouse, but came back to the NFL to become Super Bowl MVP with the Washington Redskins in January 1988. Coached with the Scottish Claymores in NFL Europe and also led his alma mater Grambling for several seasons before taking up a front office role with the Buccaneers in 2006. The Glazer family took over ownership of the Tampa Bay Buccaneers in 1995 and turned the franchise around off the field whilst allowing the players and coaches to take care of events on the field. Bryan and Joel have been incredibly supportive of the Bucs UK since we first met them in September 1997 and have gone out of their way at times to assist us across the Atlantic and on trips to see the Bucs play live. In 2005 the Glazer family became owners of Manchester United and can therefore of course claim to have won two of the biggest sporting prizes in the world, the Super Bowl and the Champions League. One of the Bucs' two first-round picks in 1995, he was the face of the defense in the national media for the next nine seasons backing up his brash manner with wonderful performances on the field. Selected to multiple Pro Bowls, he finished his career with the Oakland Raiders but always remained a Buccaneer at heart. Now works for the NFL in the media and maintains his on-field personality off it as well. 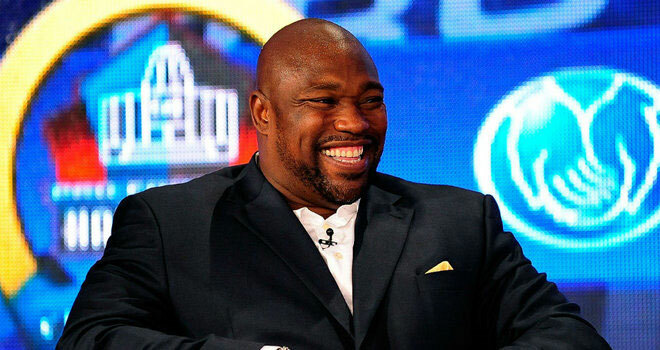 There will never be another Warren Sapp. The Bucs UK has for its entire history, has been helped and supported along the way by the Tampa Bay Buccaneers front office. 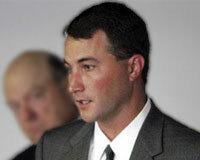 In recent years, this has been in the main thanks to Scott Smith, now the Bucs' internet manager. Scott used to be part of the PR department that supplied the Bucs UK with weekly press releases and has continued his support with a ton of information for our massively-popular special features on the 1976 expansion team. He also wrote and produced the Bucs' World Champion book and double-DVD set that should be an essential part of every Buccaneer fan's collection. 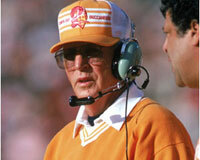 The first head coach of the Buccaneers who led the franchise until 1984 and took the team to the playoffs the quickest of any expansion team in NFL history at that time. Won four national titles as head coach at USC and was always quick with a one-liner or quip for the media after another Buccaneer loss in the early days. Remained in Tampa after he stepped down as head coach in December 1984 but died in 1998 following complications from diabetes. Originally a 3rd round pick out of Stanford in 1993 who spent his first two seasons on special teams and wondering if he should have pursued a pro baseball career instead. Threw the first pitch in the history of the Florida Marlins' organisation in 1992. But went on to become a dominant strong safety with multiple Pro Bowls and a huge fan favourite in Tampa during his 10 seasons with the Buccaneers. Went on to play for the Broncos and Patriots before retiring to a TV analyst's role with CBS Sports. 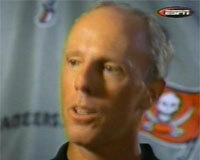 Rich McKay was involved in the Tampa Bay Buccaneers from its earliest days as his father John was the Bucs' first head coach and his elder brother JK, was a starting receiver on the team for its first three seasons. Rich originally worked as a ballboy for the team but moved into the legal profession on graduating from college and became the Bucs' legal counsel in the early 1990s. He became General Manager of the franchise in the mid 1990s and created a legacy of players and draft picks that culminated in the winning of the Super Bowl in January 2003 in San Diego. McKay left the Bucs at the end of the 2003 season having long been courted by the Atlanta Falcons' owner Arthur Blank, and he now faces the Bucs twice a year as the GM of their South Division rivals. 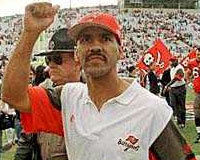 Had been turned down for many NFL jobs when he finally got his chance with the Bucs in 1996 and proceeded to have only one losing season, his first, in 13 years as a head coach in the NFL. Quiet in personality but a giant in terms of character, he helped turn around the franchise in Tampa and led the Bucs to four playoff berths in five seasons before being fired after the 2001 season. Led the Colts for the next seven years and won his Super Bowl against the Bears before retiring to work as a TV analyst after the 2008 season. 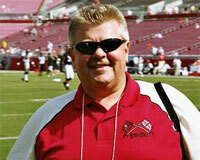 Since Phil joined the Bucs UK in November 1990, the club has been the recipients of some of the best merchandise the UK gridiron fraternity has ever seen. A huge range of T-shirts, polo shirts, jackets, caps and badges have come from Congleton and are now worn with pride on both sides of the Atlantic. 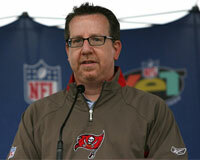 Phil also arranges the Bucs UK's ticket service for games at Raymond James Stadium. 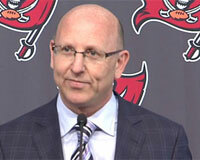 It is through his hard work and efforts, that over 400 people have seen the Bucs play in their new stadium. More than that though, Phil serves as a sounding board for ideas I may have for improving the club. For many years, the Bucs UK was a one-man show, but there no doubt that two heads are better than one. Hence it was only fitting that the two of us were in San Diego together to see the Bucs beat the Raiders in Super Bowl XXXVII. Phil, a season ticket holder at Old Trafford for many years, lives in Congleton and has two children, Sam and Amy. Signed with the Buccaneers as a free agent in 1993 from the Steelers and single-handedly changed the face of the Buccaneer defense on the field. 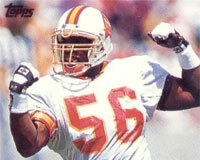 His fiery personality and extravagant performances quickly made him a fan favourite and he remained in the middle of the Tampa Bay defense for seven full seasons. After retiring from the NFL, he spent time as a coach and also had a season as the Bucs' radio colour analyst alongside Gene Deckerhoff. The finest running back in Buccaneer franchise history and remains the leader in both rushing yardage and pass receptions some 20 years after he retired from football. Originally a 2nd round pick out of Missouri in 1981, he switched from full-back to tail-back in 1983 and never looked back setting multiple franchise records over the next few seasons. Brutally over-used by John McKay and Leeman Bennett, he remained a team player to the end, even returning kicks and blocking during the 1989 season, his final one in Tampa Bay. 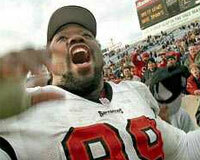 Mike was named the club's Buccaneer of the Year in 1999 and 2000 for his assistance in providing Bucs UK members with really excellent tickets for games at Raymond James Stadium. The seats that we had for the first game in the new stadium were just unbeatable, and our debt of gratitude to Mike and his team goes far beyond what money could buy. One of the best moments for me of Super Bowl XXXVII was seeing Mike sitting a few rows behind me and us both realising with the score at 34-3, that he was going to be wearing his own Super Bowl ring in a few months time. Mike was promoted to a more senior business position within the Buccaneers in 2003, a fitting reward for one of the nicest people involved in the gridiron world but left the organisation in the spring of 2005. 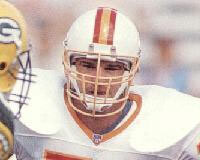 Was the 4th overall pick of the 1988 NFL draft and anchored the offensive line from left tackle for the next 12 seasons. Even went his first five years in the NFL without missing a single snap. Retired after the 1999 season having sustained a broken leg at the end of the regular season and hence missed the two playoff games against the Redskins and Rams. 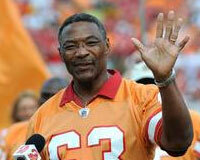 Was honoured by the Buccaneers in a half-time presentation the following season at Raymond James Stadium. 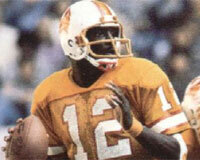 The Buccaneers' first-ever draft pick in 1976 and its most honoured player. Multiple Pro Bowls and elected to the NFL Hall of Fame in 1995. Remains the franchise leader in sacks and has been a pillar of the Tampa community for the past 30 years, serving time as the Athletic Director of the University of South Florida. 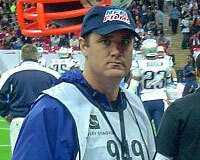 Came over to London in October 2009 for the Bucs' game with the New England Patriots and spent time with Bucs UK members at the touch football game. Sadly passed away in 2011. 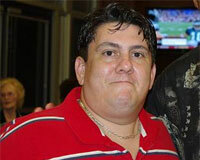 Nick Pugliese was the Bucs' beat writer for the Tribune for several seasons and his weekly notes column for The Sporting News began appearing in There's Always Next Year in 1994. 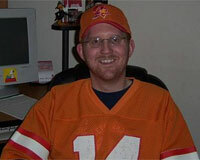 He became an Honorary Member of the Bucs UK two years later. Nick has been a great friend to myself and Phil Jones over the past few years, including his great hospitality during our two club trips in 1997 and 1998. We feel grateful in a small way, that we could repay him a little when he came to the UK during 1999 and stayed with myself and Phil, the latter taking him to see Manchester United's season finale against Tottenham. Nick married Denise in 2001 and their daughter, Tori, was born the following year with her sister Lily-Ann following in 2004. I first got to know Bill in 1985 when Bob Timoney asked him to write to me about the Bucs, A friendship began that has spanned three decades and has seen me stay with him and his family on several trips to Tampa. In 2000, I was lucky enough to be able to repay some of that hospitality when he and his wife Linda visited London. They also spent a week with Phil Jones and his family in Congleton before returning back home. But it is not just myself who owes Bill in this way, many other Bucs UK members have been welcomed with open arms on their trips across the Atlantic. 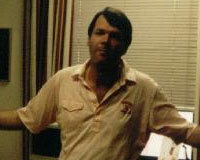 Rick was an invaluable source of information in the early days of the Bucs, providing the club with magazines, press releases and information. It was his efforts that made my 1988 trip to Tampa so special, and he continued to support the club when he moved to the Ticket Operations side of the franchise in the early 1990s. Quite simply, the Bucs UK would never have survived the 1980s without the help and support that Rick gave us in those early years. Rick moved on from the Buccaneers in 1996 and was working for the Tampa Bay Devil Rays when we caught up with him after a game against Toronto. He has most recently been working with the PGA Golf Tour promoting the tour event at the Innisbrook Copperhead course in Tampa. 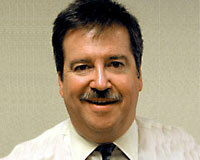 He is often also involved with Fox Sports' coverage of games as a statistician and spotter. I wrote to all the Florida-based booster clubs in 1985 looking to set up a link between them and the Bucs UK. Bob replied and a twinning of our clubs began that would see many of our members welcomed at Clearwater club meetings and their members being hosted in the UK. Bob and his wife Lil visited the UK twice and I was happy to meet with them on this side of the Atlantic to thank them for their wonderful hospitality. Bob's enthusiasm was legendary and when he passed away in 1995, the world lost one of its finest people. He will never be forgotten, and the Bucs UK's award for the Buccaneer of the Year, is named after him as a fitting tribute and is given to the person who most sums up the spirit of being a Buc over the previous 12 months. 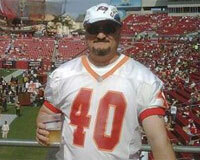 © 2013-2019 Bucs UK - The Tampa Bay Buccaneers UK Fan Club.